Using alarming, the operator can be notified when points assume a particular condition. Up to six conditions can be used to enable a particular alarm. Alarms are logged based upon time of occurrence and can be saved for up to one year. When an alarm condition returns to the normal state, they are automatically cleared. 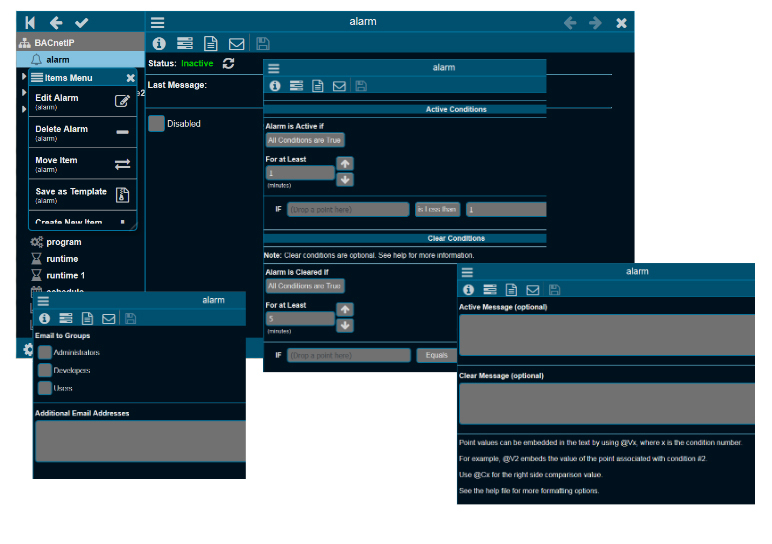 The alarm editor allows editing of alarm conditions, messages and email recipients. Creating an alarm condition is very easy to do. The user creates an alarm by first right-clicking on the device to be monitored in the device list which opens up the alarm editor. Then the point to be monitored is then simply dragged to the condition window in the alarm monitor. At this time, up to six conditions can be used to enable the alarm. An activation alarm text message is then entered, and if desired, a clear alarm text message can be entered. If this alarm notice is to be sent by email to an associate or a group of associates, there is a box to enter the proper email address or addresses. The alarm is then applied and scanning for the alarm begins. To eliminate any nuisance alarms, where short-term alarm conditions can be tolerated, a time window can be assigned to the condition logic. On the Toolbar is an Alarm icon that flashes when active conditions exist. By clicking the icon, the alarm log can be viewed and the flashing of the icon ceases. The Alarm icon will continue to display the number of alarms that are active but the alarm log will give detail to the specifics of each alarm. Alarms are stored for one year and are grouped into months. A large alarm log can be filtered by month or can be finely sorted using a filter.